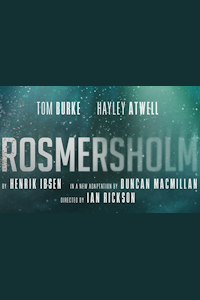 Rosmersholm tickets at Duke of York's Theatre, London. 2019. Find the best Rosmersholm play tickets at Duke of York's Theatre, West End. Beate Rosmer committed suicide in the millrace at Rosmersholm. After suffering deep depression and growing insanity her death seemed, at the time, almost inevitable. In a battle of wills, Beate's ghost is strangely brought back again by those who knew her. The memory of the dead woman and her suicide opens up old wounds and dark secrets that propel the lives at Rosmersholm towards a dramatic finale. Approximate runtime 30minutes (including any interval). Performers Tom Burke, Hayley Atwell, Giles Terera, Peter Wight, Jake Fairbrother, Lucy Briers. Author Ibsen. Producer Sonia Friedman Productions. Adapted by Duncan MacMillan. Director Ian Rickson. Design Rae Smith. Costume Rae Smith. Lighting Neil Austin. Music Stephen Warbeck. Sound Gregory Clarke. Director Amy Ball (CDG - casting director). Wednesday, 24th April 2019 to Saturday, 20th July 2019. Open 2nd May 19. Rosmersholm tickets: The tabs above allow you to select between links to suppliers and date searching. Click on a supplier's logo to see their details and on the 'buy now' button to see and check the tickets on offer.